Joshua was born into a stone sculpting community, as his mother founded the Marble Institute of Colorado. He also studied at Fort Lewis College, and his dedication to sculpting earned him an apprenticeship in Japan with Kazutaka Uchida. Joshua is an instructor at the Art Students League in Denver, CO and has taught workshops at the Denver Art Museum and The Colorado Academy. In 2009, he completed a residency at PlatteForum in Denver, it being the 2006 recipient of the Mayor’s Award for Excellence in the Arts & the 2011 National Arts and Humanities Youth Program Award. During this residency, Joshua created art from his living series and worked with at risk/underserved youth for five hours a week, teaching them about making art and living positively. 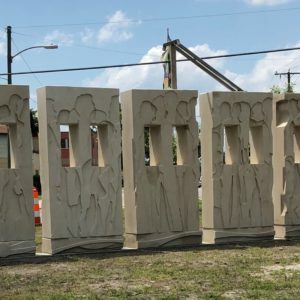 Joshua makes large scale public and private sculptures. He has been on design teams for public spaces and juried shows. Joshua has created in stone, steel, bronze, water, earth, plants, concrete, ice, chocolate, sand, and asphalt. He seeks to create landmarks with his time. Joshua expresses “I want to be involved with creating things that will be used to give an image to a place and be a beacon for our time”. Joshua’s ability to convey a concept effectively rests on his strong sense of design and precise execution. 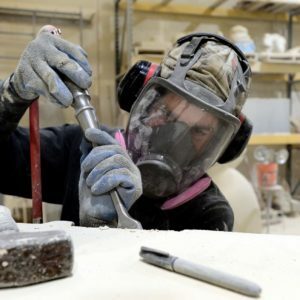 Joshua continues to follow his dreams of creating art in his Boulder studio.